Unzip Your Genes will show you how take your own health into your own hands. You will no longer sit on the sidelines—instead you can play an active and empowered role in the state of your own health. • Understand how the environment and your genes interact. • Learn how to use your own genetic information to your advantage. • Create an actionable plan based on your genomics to radically transform your health and improve your vitality. • Discover how to improve your health span and lead a productive, happy and healthy life. 'Unzip Your Genes' is a must-read for anyone looking to live a happier, healthier life. Dr. Jennifer Stagg takes her expertise in precision lifestyle medicine to a new level by allowing readers to understand how their bodies truly work from the inside out." "Your individuality extends well beyond your outward appearance. It includes differences in the minute details of your cellular functions, those that ultimately determine ‘how’ you ‘are’: how you function (at the cellular level), how you behave (your likes, dislikes, executive functions, your neurochemical pathways) and how you survive and adapt to your environment. Your genetic legacy, or genome – the sum total of genetic material passed down through generations and ultimately inherited from your parents – is key to understanding your individuality. As modern science continues to explore the marvels of the human genome, we are learning that the lines between nature (that which you inherit) and nurture (that which you develop through your environment) are less distinct than once thought. Your genetic make-up not only defines who you are, but how you interact and react to your environment. Dr. Stagg’s new book captures in a lucid and compelling manner, what so many before her have been unable to do: Explaining why genetics have an important role in the everyday discourse of health and wellbeing, while striking an admirable balance between simplicity and scientific accuracy. Dr Stagg introduces genetics in a manner that is so much more relevant than just disease diagnostics – genetics that helps us to better understand ourselves as human beings. I highly recommend Dr. Stagg’s, ‘Unzip your Genes’ for anyone interested in the dynamic and interactive role that individualized genetics play in one’s health and wellbeing (within the framework of one’s environment). I suspect that after reading her book, many will be inspired to begin their own personalized journey to optimized health." "When Dr. Stagg first shared with me the title of her new book, some months ago, I thought, wow, that is a tantalizing title (one of the best I have ever seen). 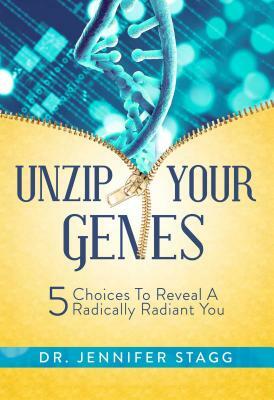 So when my esteemed colleague asked me to review her book, Unzip Your Genes, I was curious to learn if the content could live up to its title. After starting this book, (and not being able to put it down) I must say, this book delivered! Dr. Stagg’s book could not be timelier! We live in an era where the biggest cause of death and chronic disease is lifestyle induced and thus preventable! Every doctor advises their patients to eat better, exercise more and stress less. As a result, we have more gyms than ever, we spend more on diets than ever and yet we have a runaway epidemic of obesity and diabetes, which spurs the top two killers in the country, namely cardiovascular disease and cancer. So the question is, why are these simple strategies are not working? This book should be required reading for any health care provider who is, not just interesting in defeating disease, but in the promotion of wellness! Good work Dr. Stagg, I enthusiastically and emphatically endorse your book!"